T.C. 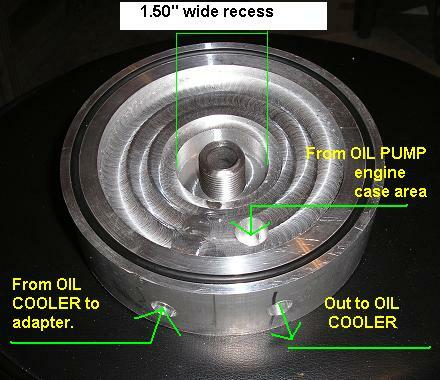 's Combo Spin-On Oil Filter Cooler Adapter=S.O.F.C.A. If you're tired of spilling oil all over your hands and the garage floor, rounding off the oil filter chamber bolt head, and in general just disgusted with the whole oil filter changing process, and have or want to add an oil cooler, then this item may be of interest to you!? This is one installed on a bike with OEM headers, and you can see that the filter just barely sticks out below the bottom level of the header pipes! With the assistance and prodding of XSChop, Maximan, and other Xsives, I have come up with a modest Spin-On Oil Filter Cooler Adapter (S.O.F.C.A.) which will allow you to more conveniently and easily change your oil and filter without much of the mess and fuss and retain your oil cooler function. 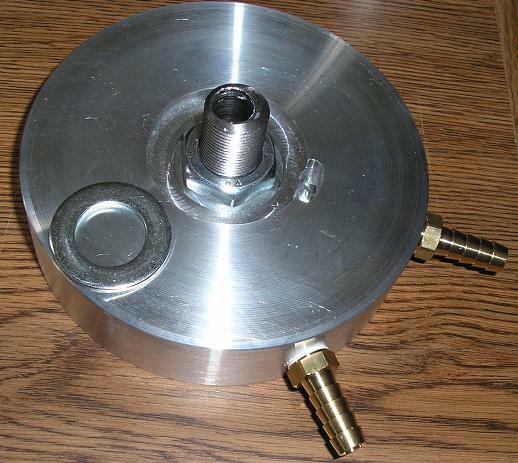 This adapter design is made from high grade strength 6061 Billet Aluminum 1.35" thick plate, machined to fit the engine of the XS-XJ1100 as well as the Venture, and the XS750 and 850 triples. 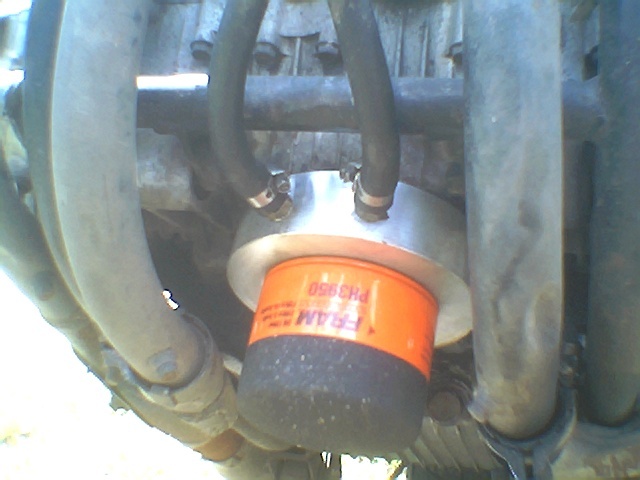 It incorporates a piece of threaded pipe that fits into the hole that the OEM bolt went into, and a nut and washer that secures the O-ring and grooved plate up onto this pipe against the engine case, the pipe becomes the fitting for the spin-on oil filter and also provides the hose fittings for the oil cooler! With the cooler fittings, the plate could not just be threaded on like the original SOFA. The plate has to be slide up into position to keep the fittings oriented forward. 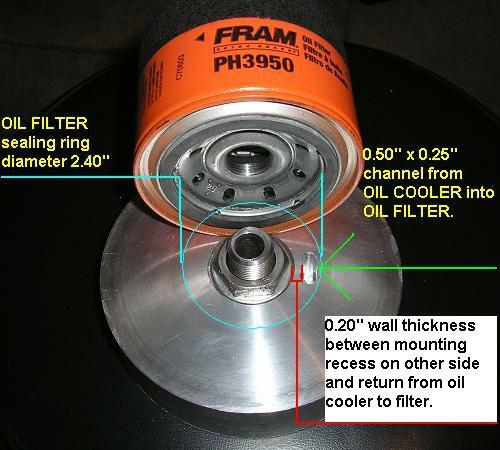 This design uses a large nut and washer to secure it with a recess cut into the filter side of the adapter; this adds to the overall thickness and puts the oil cooler to filter supply hole farther from the mounting center requiring the use of a wider AUTO filter, the Fram PH3950. This is from the Fram site. The PH3950 is 3.09" tall, 3.66" diam. 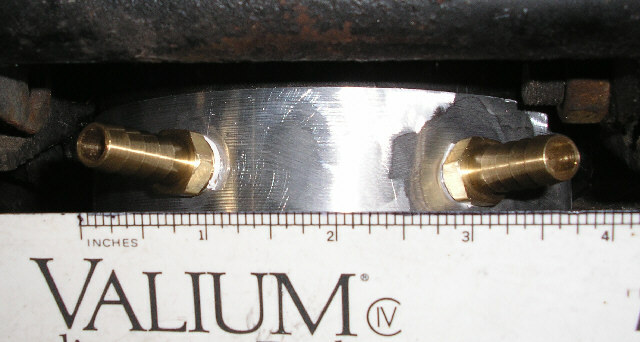 12 PSI relief valve setting, anti drain back valve, and 20mm X 1.5mm center. The OEM chamber is ~2.75 in. deep and your oil cooler plate is another 1" thick, so the total sticking down from the engine is ~3.75" to the bottom of the OEM filter chamber! The SOFCA plate is ~1.3 in. deep, the PH3950 filter is ~3.09 in. tall. This is a total of ~4.4 as you can see by this photo and the red hash mark at the bottom, the ruler isn't exactly aligned with the engine case fitting edge! A few folks have some fancy pipes that cross right beneath the OEM chamber, and they have to take their headers off to change the filter. If you already have a cooler plate you will probably still need to drop the headers to allow extra room for spinning the filter on and off! And you'll need to be sure that you have an additional ~.75" of clearance between your existing cooler/filter chamber and the pipes. However, if you have either aftermarket headers or OEM that do NOT cross beneath the filter, then you will want to ensure that you have about 4.5" between the #2 and #3 header pipes to allow clearance for the hoses coming off of the adapter, see below! This is just my project bike, the headers are removed, I don't have any OEM ones to show anyways! A few more technical notes: I was able to acquire some thinner mounting nuts, so I didn't have to cut the large ones in half! 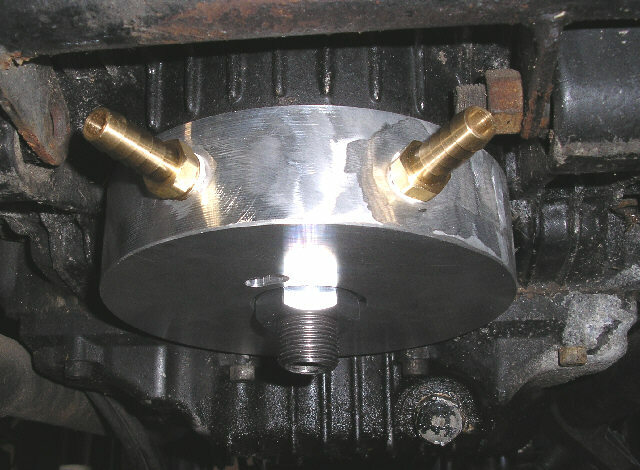 The washer and nut when tightened against the plate will make a seal around the mounting threaded pipe and the PLATE so that no O-ring or rubber washer is needed between the nut/washer and plate to seal it, the oil will NOT leak around it, but will go out to the oil cooler! The O-ring is a newer thicker version, Buna-N from McMaster-Carr, but since the plate will NOT be removed during oil filter changes, nor the O-ring replaced, this is why it is highly suggested to use the sealant along with the O-ring to provide a lasting SEAL! The fittings are machined brass 1/4" NPT thread, 3/8" OD hose fitting, rated at 250 psi! The fitting closest to #1 cylinder is OUT to Cooler. thanks for suggestions from JWOEL, Xsive, Mechanical Engineer! Below are a few more photos of a design modification. The original one did not have a very deep recess in the PLATE, because there was a prominent one in the Fram Filter that allowed much of the nut to receed into the filter, so that just the washer needed to be recessed into the PLATE! 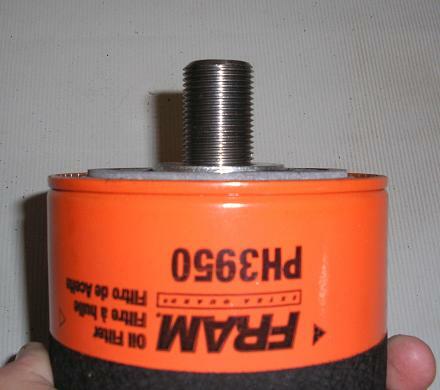 However, folks like 79XS11F/Rob in Canada as well as Stralya may find it hard to find the FRAM filter, and so it was suggested that I cut a deeper recess into the plate to allow the NUT to sit down farther away from the filter mounting surface for those brands of filters that do NOT have a prominent recess. The problem was that too deep a recess meant a THICKER plate. So, you can see that without the washer, with the slightly deeper recess, one can now use essentially any brand of filter that is similar in size to the FRAM! It was also suggested to make the recessed area a bit wider to allow the easier use of a wrench/socket etc around the nut, and so this was also added! Thanks for viewing, hope you find this useful! Yesterday I rode home in the rain. Well, they did say 80% chance of rain when I went to work, but I figured I wouldn’t mind riding in 80° rain. I didn’t. When I got home, there was a package and letter for me. Woohoo, Christmas in July. I ripped open the letter, and found an o-ring. In the box was a beautifully machined new SOFA/OFA. Well done TC. It looks better than either of my designs. I had thought of that, but wasn’t sure of the nut clearance in the filter. Is that why you chose that filter? There was also a nice set of instructions, complete with color pictures. Oh well, if all else fails, read the instructions. After looking over the parts, I determined that this should go together quite nicely without any goop or glue. If I had any leaking problems, I would retain their assistance. The only problem was that it went together so quickly, I didn’t even have time to drink one beer. So I let it idle in the garage while I had one, remember the rain? About 30 minutes of idling, and no signs of leaks. I put 40 miles on her today going to and from work, still nothing. How often do you want reports? I will get you some nice pictures this weekend. My only question now is, how much for one for my other bike? I LIKE IT! Followup: Here are the pictures of the SOFA/OCA installed. 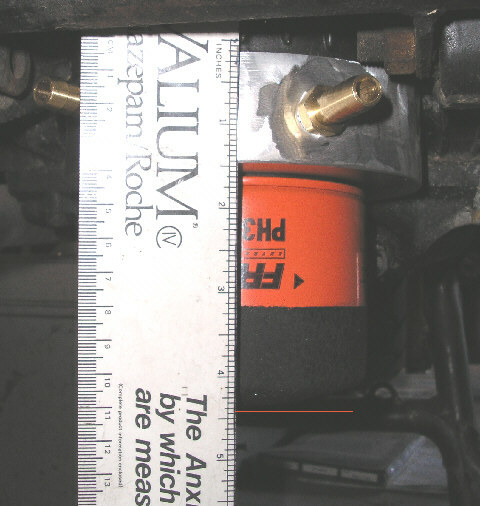 As far as applying Loctight at my next oil filter change, I have already thought about that, and I was going to see how the old oil filter removes first. I don't think there is going to be a problem, but I am prepared in case there is. I will be watching for when you start producing these, so I can get one for my other bike. Let me know if there is anything you want in the way of a testimonial. Like I said before, I LIKE IT! The Unit Price is $55.00, which includes S & H Priority Mail to Continental US. International Orders will require a little more for the additional postage! PayPal account info is: TopCatGr(at)cox.net *Replace the (at) with @ of course! Please be sure to include your real name, address and XS11.com handle in comment with PayPal notice so I can keep track of who has ordered and paid, had shipped to, etc.! Here is the link to the thread where it all began! 1.) Drain oil and remove filter chamber and mounting bolt. Allow oil to drain thoroughly from engine. 2.) 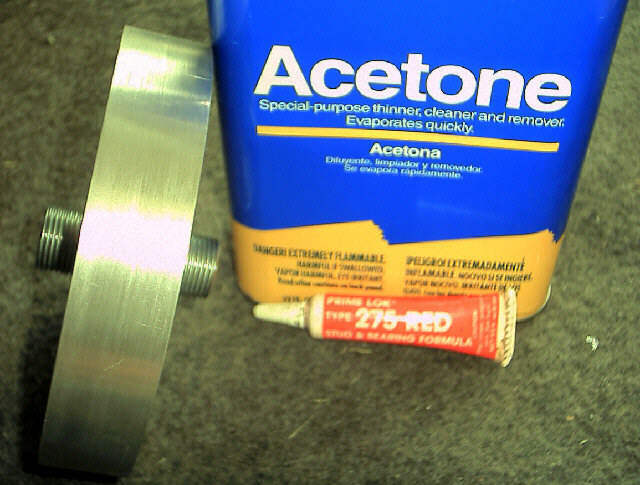 Prepare engine outer seal ring by cleaning with carb cleaner or equivalent, then Acetone to remove any traces of oil residue from mating surface. Also clean central threaded hole that mounting pipe will be threaded into. 3.) Currently, adapter plate is RAW aluminum, it has not been anodized, and so to protect it from road salts and such, a spray paint coating is recommended, either color or clear. Place the central threaded pipe into the plate with the nut/washer on the EngineSide, and then affix the oil filter to the Filter Side with a light snug, no oil on the rubber seal, yet! Then turn plate so that the engineside edge is down, and then after cleaning plate with Acetone, apply desired coating to outer surfaces, and allow to dry. Once dry, remove filter. 4.) Do a test fit, screwing the threaded pipe into the engine at least ½” or so. Mount plate/washer and nut so that it’s flush. 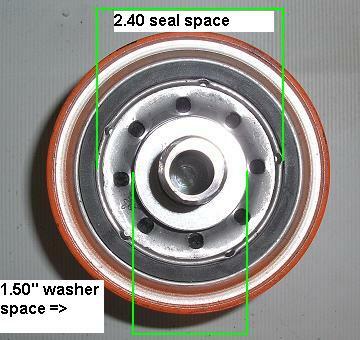 Ensure you have enough threads to spin on the filter! 5.) Turn plate over, inspect mating surface for smoothness, if any paint dripped around edge, clean it and ensure smooth surface. Position thoroughly cleaned and degreased rubber O-ring into groove, and then apply thin film of Permatex/Yamabond/or equivalent Silicone Copper High temp gasket replacement sealer, not just RTV onto plate’s mating surface and O-ring and groove, allow to skin for about 10 minutes. Then apply generous amount of Locktite of choice to threaded pipe for a ½ ” length from end and screw the pipe into the engine the same distance you did in the DRY FITTING! 6.) Now, position the plate up to the engine with the oil supply fittings facing forward, and start threading the washer and nut combo again with Locktite, and screw the nut up so that the plate becomes flush with the engine. Once the O-ring makes contact, you can then tighten it using a crescent wrench to compress the O-ring so that the plate and engine case surfaces meet. You will see the gasket sealant ooze out slightly as you tighten, usually requires only about another ½ turn to get it really snug!! 6.) LET IT CURE OVERNIGHT or for the required 24 hours per the gasket sealer’s instructions!!!! Now, replace the drain plug screw, put the Fram PH3950 spin-on filter in place, this time using a thin film of oil on the rubber seal and hand tighten in place, and then fill with oil. Next, turn engine over for about 20-30 seconds, don’t let it start, just to prime the filter and engine’s top end with oil. Pause every 5-10 seconds to let the starter motor rest a few seconds, but you should eventually see the oil pressure light go out, then it’s safe to supply fuel, choke, and start it! Of course let it warmup and then check for leaks before driving! 7.) The O-ring/groove is like the OEM design, but because you should NOT be removing the plate or replacing the O-ring at each filter change, you still need to apply the sealant to the mating surface as instructed to ensure a lasting seal incase the O-ring flattens with age/heat! IF the O-ring doesn’t seem to fit exactly, you can stretch it a few times and it will then fit without rolling out!